A bit of insect knowledge helps you act quickly at the right time. Stinging insects are abound during the summer, though some are more dangerous than others. Many stinging pests sting repeatedly, while others will lose their stingers after the attack. As a matter of fact, bumble bees, carpenter bees, and honey bees all sting, but it’s only the worker honey bees who’ll leave their stinger in your skin. As soon as you’ve been stung, the first thing you should do is check to see if there’s a stinger in your skin. The honey bee’s stinger functions by slowly releasing venom into your skin. Thus, it’s imperative to remove the stinger and attached venom sac as quickly as possible. Doing so will reduce the intensity of your reaction. While there is disagreement about the best way to remove a stinger, the most important thing is to act fast. Pull out your wallet! A credit card is a great tool for scraping a honey bee stinger out of your skin. Simply press and scrape. If the card doesn’t catch the first time, simply repeat the movement until the stinger comes out. Another helpful item that you may find in your wallet is a coin. Pennies, quarters, or dimes will all work. Simply use the edge to scrape out the stinger. Find the solution in your kitchen! Many people have successfully used butter knives to scrape stingers out from their skin. Just be careful that you use the dull side of the knife. The sharp side can further damage your skin. Alternatively, grab an onion out of the pantry and cut it in half. An onion can be used on its own, or in conjunction with another method. Use the edge of an onion half to scrape the stinger out. Some say that the juices from the onion will help reduce swelling. Do you carry a nail file around in your bag? Great news! If you get stung by a honey bee, this little cosmetic tool will have a new use. Drag the flat end across the sting slowly until the stinger comes out. You can also use a needle to try scraping the stinger out. This is a good method for those of you with more stinger removal experience. Since a needle can be very sharp, this may not be the best method to use with children. We’ve saved the simplest method for last: your fingernails! If your fingernails are long enough, you may not need any other tools for insect stinger removal. Just slowly scrape you nail across the skin until it catches and pulls out the stinger. If your chosen method isn’t working, try icing the sting before you continue. This will simultaneously help reduce swelling, and maker the stinger easier to remove. 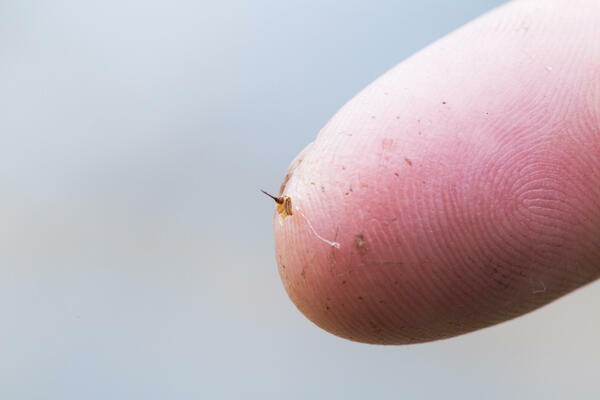 Another commonly cited method for stinger removal is the use of your fingernails or a pair of tweezers to grab and pull the stinger out of your skin. There is controversy surrounding this method, as some claim that squeezing the stinger simply injects more irritating venom into your skin. This method is likely best if the stinger is sticking out of your skin and you know that you can get a good hold on it. Otherwise, try the scraping method first. The best remedy for a bee sting is not to get one in the first place. For people with serious allergies, stings of all kinds can cause serious reactions. If someone experiences headaches, shortness of breath, hives, or nausea after a sting, they should visit a doctor immediately. Keep your friends and family safe by keeping stinging pests off of your property. Work with a licensed professional to remove and prevent stinging insects. Home Pest Control uses environmentally friendly methods and long term planning to keep unwelcome visitors out of your yard. Want to learn more? Download our free resource, “A Quick Guide to Stinging Insects: Identification, Prevention, and Threats” here!